What is the best time to Launch new iPhone app in the App Store? This is the era of smartphones and mobile apps. Billions of people across the world are using these for doing so many of their daily tasks. iPhone has a significant share in this smartphone market. iOS apps have been well known for their enhanced features, attractive design and authenticity which have pushed them to stay ahead in the app market in global market. Most of the iPhone app developers have been little confused about what should they do after developing an app. 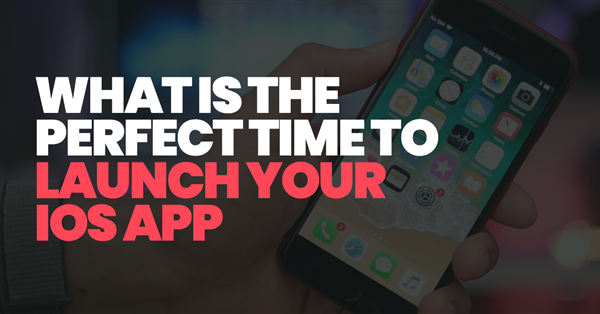 The main question in their mind is what is the best time to launch their app? They have done all the important work of development, testing and final preparation and therefore now launching of their app at the right moment is very crucial for the success of the app as with research it has been found that the time and day for launching the app is very important to determine the future prospects of the app. Timing can actually make or break the chances of the success of any product and It is especially true in case of launching and promoting apps. Hence when we talk about the apps, for any App Development Company there is a lot depends upon the timing. Most of the marketers understand that weekends are the best time to release an iOS app generally as it has been observed in most categories, this is the time when iPhone users use them often, make purchases and download the new ones which appear on the App Store. Although this result can vary across different types of apps. Hence we need to do little more research on this subject. When iPhone Users Download the Apps? Best Weekdays or Weekends to Launch iPhone Apps? If you are an iPhone App Creator and builds iOS apps then it is very important to know the analytics results. In the above findings we came to know about some crucial things which say weekends are the best days to launch an app and promote it especially when the app is from lifestyle category. But if your target audience is more involved in the fun activities on the weekends then you need to apply a different strategy especially in the case of business apps and Mondays through Fridays are the best days to launch such iOS apps. When people are at their work office, they usually download finance apps even though they want to use them and made purchases through them during the weekends. People like to maintain their products consistently across weekdays and weekends which ensures usage and revenue throughout the week. When we talk about medical apps the results are different and their downloads tend to peak on Sundays but most of their revenues are obtained between Sunday to Wednesday and also on Thursday. Generally speaking, the best day to launch your app is either Wednesday night or Thursday, because the iOS App Store changes features every Thursday and you may get featured that day as “New app”, “New game” ... etc. That means all of your marketing/PR/Adverting efforts should start on Thursday because Apple likes it when an app is being privately promoted at the same time when it is being featured. So many businesses Hire iOS App Developers to build a successful iOS app but the timing, as well as the promotion of an iOS app launch or even a new update are very important things and really tricky. Generally, iPhone app developers don’t know beforehand the time when Apple will approve their apps and then put them into their App Store. Although Apple provides a tool which shows the actual percentage of the iOS apps which have been approved over the previous 5 days on its website. But as every iOS app which is submitted is different hence there is no fixed review time. Generally, App Store reviewers take nearly 5 days to approve iOS apps. Earlier this process used to take around a month due to a particular communication process which Apple used to do with app developers few years ago. And in case Apple has any issues related to the iOS app, the entire timeline can stretch even further. It is highly important for the iOS app developers to strictly follow the App Store Review Guidelines which certainly help in streamlining all the things as much possible as it can be. Apple also provides a certain way for the app developers to easily set a particular future release date for the iOS app which can allow the developers to take full advantage of the trend of high app downloads and usage on weekends easily. iPhone App development is a profitable process which can be expensive in the beginning for any business which want to launch their iOS app. Hence it is highly important to take the steps very carefully. We have discussed various trends and aspects of iOS mobile app launch. You should consider them carefully whenever you are choosing the best time to launch your iOS app. You should also promote your iOS app passionately and also follow all of the App Store guidelines and various policies which are updated from time to time. If you will not follow these suggestions, then you will not get the desired results as the exact timing of successfully launching the app in the market can lead to success or failure of the iOS app.